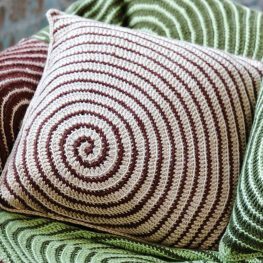 Crochet cushions and crochet pillows are a fantastic way to use your skills to create a decorative element for your home. You can make pillows as gifts, or to switch up the color scheme in your own living space. They are also a great way to try new stitches and techniques on a smaller scale and to have a useful finished item when you are done. 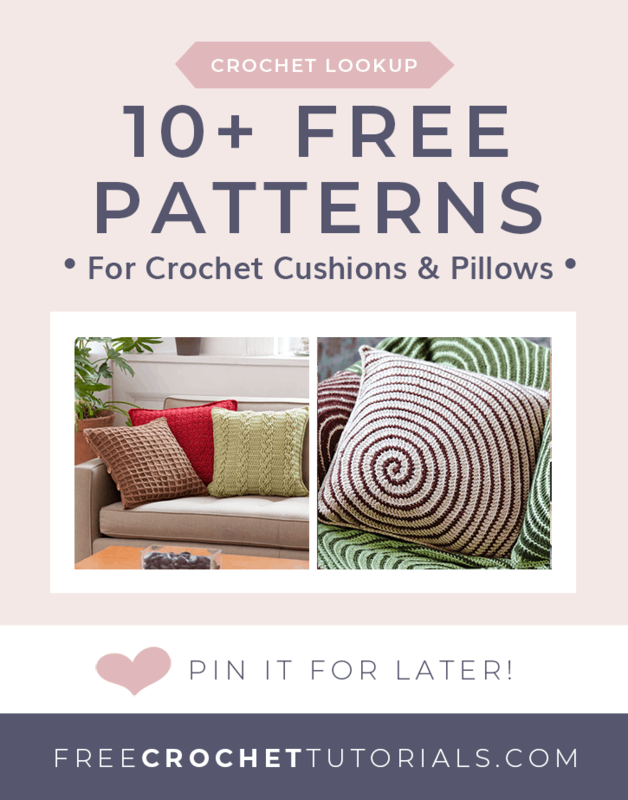 I have included a selection of free pillow and crochet cushion pattern links below. This great pillow designed by Sincerely Pam. The finished pillow using a 10 mm hook is 14 inches by 14 inches. 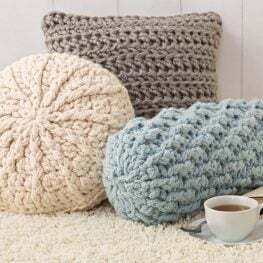 This free pattern includes 3 different crochet pillow designs. The instructions for a round pillow (16 inches diameter), a square pillow (17 inches diameter) and a neckroll pillow (17 inches by 7 inches). 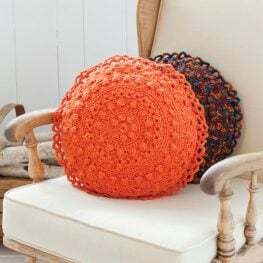 These lovely puff stitch round pillows from Red Heart are 16 inches in diameter. The pretty texture of the pillows are created with puff stitches in medium weight yarn using a 5 mm (H) hook. This fun design is available from Yarnspirations. The design creates an 18 inch by 18 inch pillow. These fantastic textured pillow designs are crocheted with Red Heart Soft yarn with a 6 mm (J) hook. You can download the free PDF pattern from Red Heart. The instructions for this traditional granny square pillow include step-by-step photo tutorials and a stitch diagram. This gorgeous mandala style round pillow was designed by Anneke Wiese. Download the free PDF of the pattern at the link below. This fantastic pillow cover is crocheted with medium weight yarn and a 5 mm (H) hook. The finished cover is 18 inches by 18 inches. The pattern includes written instructions and chart. This design is very eye catching. The instructions include a free PDF, a blank cushion chart so you can modify the colors to make your own color scheme. 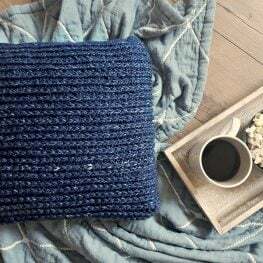 Make this fun rectangular throw pillow with a N hook and 2 skeins of Caron Simply Soft yarn. This pillow has a very unique design and I totally love it! It has fantastic texture from bobble stitches and the fun fringes are not on the edges but within the design itself adding to this pillow's uniqueness. Tapestry crochet allows you to create this elegant Ferne Cushion Cover design. This pattern follows a prepared color grid. Rhondda is a freelance Crochet Designer and full-time Blogger at Oombawka Design Crochet. Here she shares her love of crochet with the online crochet community through her beginner friendly free patterns and tutorials. Rhondda recently contributed 5 designs to the book: Bold Baby Crochet. She currently resides in Ontario, Canada with her husband and two young children. Find her patterns on Ravelry as RhonddaM.